Visitors to the Carter Fold may visit the cabin and birthplace of A.P. Carter following completion of a years-long relocation and restoration project. The cabin has been moved from its secluded and inaccessible original location to a spot virtually only a few steps from the Carter Fold building and the Carter Family Museum. A visit to the Fold combined with a tour of the museum, which itself used to be A.P. 's store operated by him almost to the time he passed away, in 1960, provides a Carter Family experience and education previously only dreamed about by A.P. 's children Janette, Joe, and Gladys (all now deceased), as well as numerous other descendants. 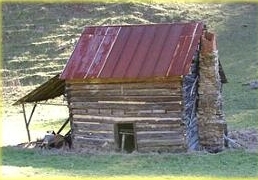 Built in the mid-1800s, the cabin was originally located in Little Valley, which runs parallel to Poor Valley. There was no public access to its original location, yet it was designated both as a national and a state (Virginia) landmark. In order to remain on the historic registers, the restoration consisted of a costly and time-consuming procedure involving professional preservationists, archeologists, as well as craftsmen, carpenters, and historians. The cabin had to be taken apart meticulously board by board, brick by brick, moved, restored and in the case of some items replaced, and then rebuilt. Nothing but the most loving care on the part of everyone involved was given to the tremendously complicated project. A.P. Carter descendants Roger Carter, Fern Carter Salyer, David Carter, Ann Carter Collie, and their familes donated the cabin, an invaluable contribution without which the project could not even have begun. A tremendous amount of gratitude also goes to the deeply appreciated financial contributions from numerous fans, local businesses, civic groups, and countless other supporters. Besides being the birthplace of A.P. Carter, the cabin also was the place of birth for his seven brothers and sisters and his brother Ermine's three children, Roger, Fern and W.L. and grandfather to David and Ann (mentioned above). The photograph at the top shows the cabin late in 2002, prior to beginning its relocation and restoration. 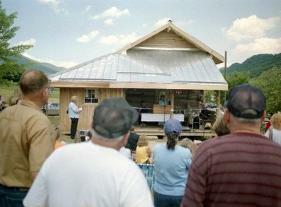 The May 29 (2004) dedication of the cabin was a day-long affair highlighted by a benefit concert starring Marty Stuart and the Fabulous Superlatives. The afternoon ceremony featured speakers and musicians from throughout the valley as well as Carter descendants from Nashville. The day was deeply emotional for the entire family but especially for Joe Carter and Janette Carter, now deceased, but at the time of the cabin dedication, the two surviving children of A.P. Carter and wife Sara. Family friends Tom T. Hall, Marty Stuart, and his wife Connie Smith joined various Carter Family members participating in the dedication ceremony. 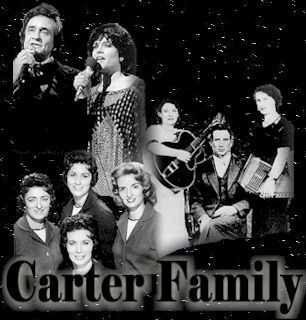 These included Joe and Janette Carter and Janette's daughter Rita Forrester; Carlene Carter, daughter of June Carter; John Carter Cash, son of the late Johnny Cash and June Carter; Lorrie Bennett, daughter of the late Anita Carter. Those speaking were Tom T. Hall, John Carter Cash, Ralph Peer II, Joe Carter (photo at right), Fern Salyer, and Marty Stuart. One musical highlight featured Carlene Carter, Lorrie Bennett, Rita Forrester, singing with John Carter Cash on guitar and his wife Laura on fiddle. Their performance of "My Native Home" was meant to be a special surprise for Janette, whose dedicated care for the Carter Family legacy coupled with years of hard work has been the rock-solid foundation of the Carter Family Memorial Music Center. Beloved veteran country superstar Connie Smith presented a special dedication prayer opening the ceremony. Marty Stuart, with his band, closed the ceremony with "Worried Man Blues." 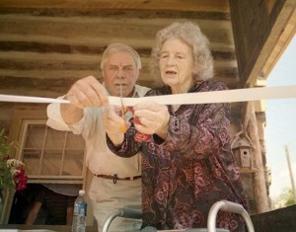 Janette Carter, who for many years directed the Carter Fold and handled the affairs of the Carter Family legacy, cut the ribbon officially opening the cabin for visits. In the photo at the right, Tom T. Hall assists. The A.P. Carter Cabin will be open for visitors during the same hours of operation for the Carter Family Museum, primarily on Saturdays beginning at 6:00 PM. 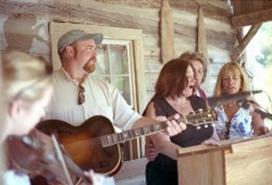 The Carter Family Memorial Music Center is a non-profit organization.